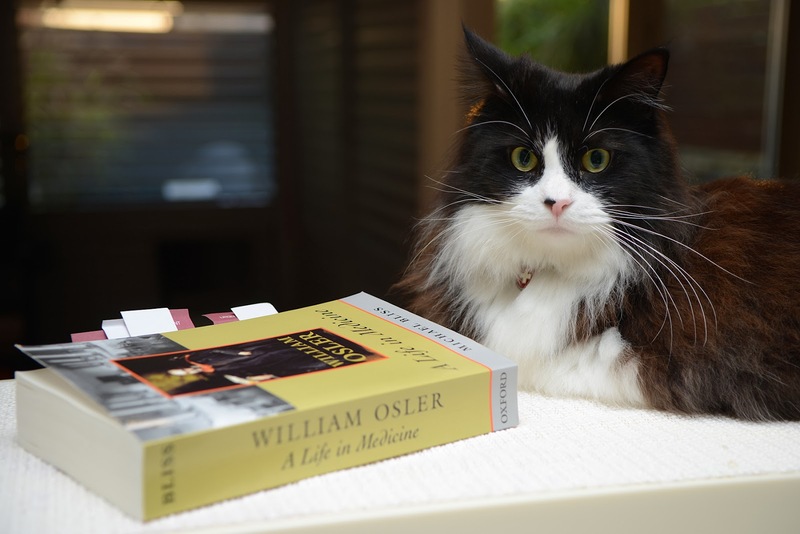 Hero contemplates William Osler: A Life in Medicine. It helps a man immensely to be a bit of a hero worshipper, and the stories of the lives of the masters of medicine do much to stimulate our ambition and arouse our sympathies. - Sir William Osler, Aequanimitas. I confess to being something of a hero worshipper. There are people throughout history, many of whom remain alive, whose lives I hold as a great example. I'm not going to embarass them by listing their names, but William Osler was a bit of a hero to many and his biography has been written and rewritten and pored over in the hope that it might offer tips and inspiration to those with a medical bent. Osler (with the “o” pronounced as it would be in “host”) is regarded by medical historians as one of the greatest doctors in history. His aphorisms are frequently cited, and it is through versions of these that I came to learn about him. Before motivational speakers were all the rage, Osler was rocking stirring statements which apply equally to matters of public health as they do to tasks like unstacking the dishwasher, such as “By far the most dangerous foe we have to fight is apathy – indifference from whatever cause, got from a lack of knowledge, but from carelessness, form absorption in other pursuits, from a contempt bred of self-satisfaction” and “to know what has to be done, then do it, comprises the whole philosophy of practical life”. 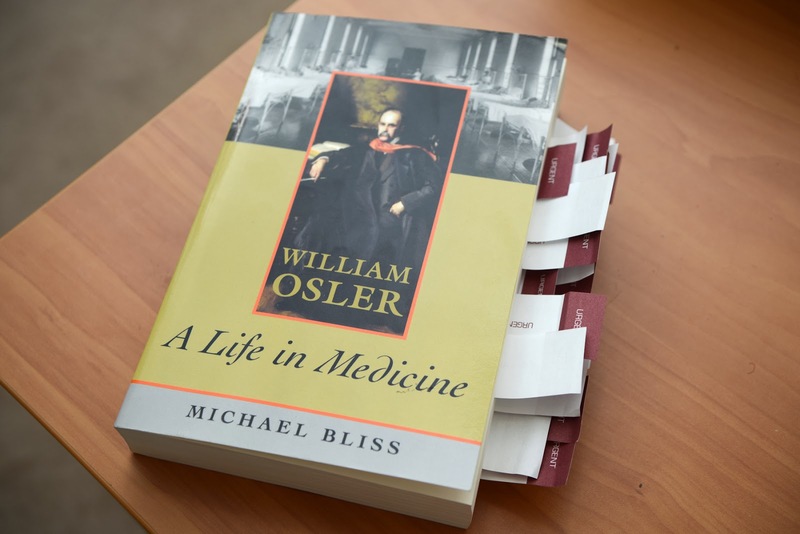 I read “William Osler: A Life in Medicine” by the prolific Canadian historian Michael Bliss who worked on the document for several years (it turns out Bliss, Emeritus Professor of the University of Toronto, doesn’t do anything by halves, having compiled some staggering biographies. He churned through thousands of letters and papers, visited libraries around the world, interviewed descendants and managed to distil this into a very readable book). In reading it I served the dual purpose of acting as a hot water bottle for Mike and Hero whilst absorbing much about Osler that I didn't know. I decided to compile ten things I learned, but there could easily have been twenty. Or thirty. Osler, known for his ways with patients, spent much of his early career communing with the dead. 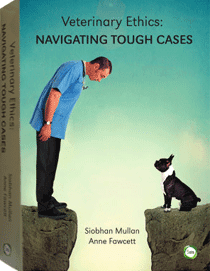 The oft-quoted Oslerisms relate to examination of the live patient, treating the “patient not the disease”, and cultivating an appropriate bedside manner. Yet he spent a huge amount of time performing post mortems in the “dead house” and embraced pathology. This was in an era where slaves and poor people were often being bumped off to provide teaching material for medical students (though there is no suggestion that Sir William was associated with medical homicide). “To investigate the causes of death, to examine carefully the condition of organs, after such changes have gone on in them to render their existence impossible, and to apply such knowledge to the prevention and treatment of disease, is one of the highest objects of the physician" (p66). Even his brain is preserved, although the whereabouts of 3.6g of the organ are unknown (they were suspected to have been borrowed by some eager fans). He was an academic double-dipper in the most productive sense. “He was an eager joiner and subscriber, and as a researcher and publisher he mastered the knack of making the most of his material. An interesting case or specimen might be exploited for teaching purposes, first in the morgue, then in class. Then it would be presented at [the Medico-Chirurgical Society], whose minutes would be published in one of the locally edited medical journals. Specially noteworthy cases…were written up as separate articles and published in journals and sometimes separately reprinted. Off-prints were sent to friends, acquaintances, experts in the field…Later, Osler’s cases might be agglomerated in lectures and papers on characteristics of diseases. Finally, the original pathological specimens would be preserved, labelled and displayed in the Facility’s museum.”p87. Notes to self: be super productive like Sir William Osler. (Do anyone else's books develop Post-it pox after reading? or am I living in Nerdsville, population one?). He was an early proponent of ‘one medicine’, hanging out with and even teaching vets. 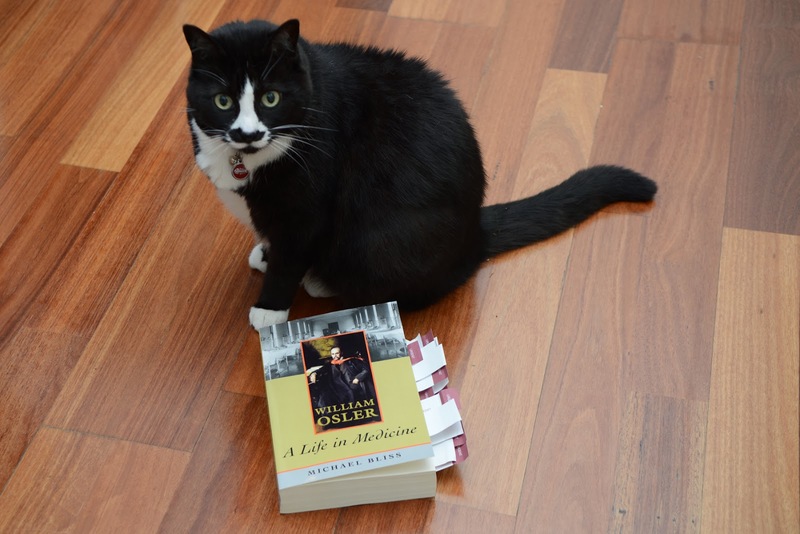 Bliss writes: “Osler was keen to track down unusual cases in animals as in humans, and exhibited animal specimens both to the Medico-Chirurgical Society and the fledgling Montreal Veterinary Medical Association”p93. He lectured at the Montreal Veterinary College, discovered verminous bronchitis as the source of a spate of mortalities at the Montreal Kennel Club (later named Oslerus osleri), and was even president of the MVMA from 1879-80! He juggled academia and private practice. My impression of Osler was of a busy doctor in private practice, but he spent most of his time associated with the finest medical schools and was no stranger to university politics, fundraising and the woes of administration. Osler knew too well the conflict between what he called “the two great functions of a University…The work which shall advance the science, which brings renown to the professor and to the University…On the other hand, the teaching function of an institute…” p126 which he suggested was apt to be neglected in pursuit of its “bauble reputation”. He was concerned about non-clinicians being solely responsible for clinical education: “I cannot imagine anything more subversive to the highest ideal of a clinical school than to hand over young men who are to be our best practitioners to a group of teachers who are ex officio out of touch with the conditions under which these men will live…”(p387-388). When medical schools sought to introduce full-time salaried positions, Osler baulked – he felt that unless rewarded by a large private practice caseload (and income), the best clinicians wouldn’t take on teaching. He was a creature of habit. I love the little details in biographies. Like reading about the morning routines of medical luminaries. In general, the most productive people are the most predictable. When working on his textbook, Osler’s day progressed like clockwork – he dictated from 8am-1pm, saw patients from 2-6.30, had dinner, bummed around til 9.30, went to bed with a good book for an hour at 10pm and slept soundly til 7am. He had the whole “shut up and write” thing down pat. There is a photo of Osler writing the textbook at his desk, piles of books spewing onto chairs and onto the floor, which anyone who has wrung their brain out over an essay can relate to. True, Osler didn’t have to contend with the constant distractions of email, mobile phones (he delayed installing a landline til he absolutely had to) or the internet, but he did receive a gazillion notes in the post that he was obliged to respond to. So I think we've established that my image library contains zero images of Sir William O. But it now contains some rather tasteful photos of his biography with the best looking feline models in the known universe. He was aware of the perils of over-medicating. “A desire to take medicine is, perhaps, the great feature which distinguishes man from other animals,” he wrote. Since then studies have documented the tendency for doctors to cave in to the “pressure to prescribe”, but Osler knew – even before antibiotics were available – how strong the human desire for a silver bullet was, even in the absence of evidence that the patient will benefit. In 1909, before the emergence of big pharma as we know it, Osler wrote that “Far too large a section of the treatment of disease is today controlled by the big manufacturing pharmacists, who have enslaved us in a plausible pseudo-science” (p361). (If this topic interests you, I highly recommend the works of Ray Moynihan, found here). Osler talked the talk and walked the walk. Osler spent every waking moment thinking about medicine in some form another. Students and colleagues loved him not just as a diagnostician and teacher, but also “in demeanour, dress, manners, love of good books, Saturday-night sociability, and a near-religious commitment to medicine as a way of life” p228. He spawned dozens of Mini-me’s, with students imitating him, dressing in the same clothes and affecting his gestures. But Osler knew he wasn’t perfect and always sought fellowship with colleagues. He felt that solo private practice created “an egoism of a most intense kind…Ten years of successful work tends to make a man touchy, dogmatic, intolerant of correction and abominably self-centered” (p248). His life philosophy was simple: do the day’s work well and not spend too much time fretting about tomorrow; and cultivate equanimity. He had no illusions about what doctors could do for patients. Osler didn’t fool himself into believing that it was a doctor’s sole job to cure patients of medical afflictions. Rather he realised that he helped in varied ways: a) making the right diagnosis and prescribing a successful treatment (the traditional way); b) (more commonly) making a helpful suggestion in terms of prognosis or management; c) not knowing but confessing ignorance; d) reassuring the patient. Offering comfort was often the only thing he could do, and something he saw great value in. He probably wasn’t as Oslerian as the Oslerians. Osler wasn’t perfect, but was practically canonised after he died, with Oslerian societies springing up all over the world. While he argued that a doctor’s demeanour should be one of good natured equanimity, and that “it is an unpardonable mistake to go about among patients with a long face”, Osler was a busy and well-remunerated fellow. “He had a delightful beside manner and inspired warm feelings of hope and confidence, but he gave individual patients very little of his time,” Bliss writes. “Modern editions of [Osler’s magnum opus] The Principles and Practice of Medicine are far more patient-centred than Osler’s versions ever were, and modern doctors probably spend more time talking to their patients than Osler did” (p500). He had some ideas which probably fly in the face of modern “Oslerian” values – such as the notion that people are most productive between 25 and 40 years, after which it all goes to pot. One must remember that in Osler’s day one could rely on one’s goodly spouse, a raft of servants and stenographers, chauffers and assistants to help one sail through life’s little necessities and “let each day’s work absorb your entire energies.” The academics and practitioners I know today don’t have butlers at their disposal (if I did mine would be promptly dispatched on a bok choy run for the guinea pigs). Despite claiming that doctors should be balanced, Osler was a workafrolic. An oft-quoted Oslerism is that “the young doctor should look about early for an avocation, a pastime, that will take him away from patients, pills and potions” (Aequanimitas), but I don’t think he took his own advice. He even wrote a speech suggesting that good old hard work is “the balm of hurt minds”, the ultimate virtue. If you can call hunting for novel microscopic organisms or organising one of the world’s most impressive medical history collections an avocation, sure…the guy had a balanced life. According to a lecture to students at Yale, Osler espoused a philosophy of living in “day-tight compartments” – burying the past, ignoring the future, and immersing oneself in the present. “As a bold surgical experimenter in New York in the early 1880s, Halstead had pioneered in the use of cocaine as a local anaesthetic, had taken to snorting it, and, along with all of his assistants, had become a full-fledged addict”p174. Harvey Cushing, the famous neurosurgeon after whom “Cushing’s syndrome” [hyperadrenocorticism] takes its name, was a chain smoker AND a biographer of Osler. He spent FIVE YEARS drafting a one-million word Osler biography, which was eventually cut down to 600,000 words. Bliss, who pored over Cushing’s work, subsequently wrote a biography of Cushing. That’s next on my list of books to read.